The scuffle involving Semi Radradra. FORMER Parramatta Eels star Semi Radradra showed he's not someone you want to mess with after he kicked an opponent who laid him out with a cheap shot. 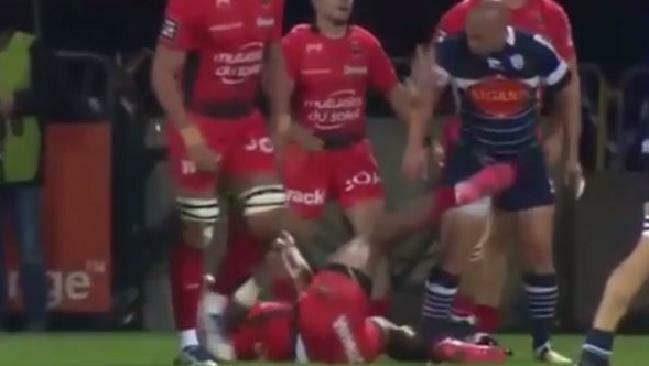 The flying Fijian, now playing for French Top 14 rugby side Toulon, was up against Agen on the weekend. With his side 7-3 up early in the first half, Radradra took a tap to restart and floated a pass to a teammate. But before it could even hit the target, he was flattened by Ricky Januarie with a rib-crushing hit that sent him tumbling to the turf. The pair kiss and make up. Former Eels star Semi Radradra was involved in a bizarre incident in French rugby. Janurie then delivered a verbal sledge to his felled opponent which prompted Radradra to lash out, aiming a kick to his nether region. Comedic scenes followed with the camera panning to show both players rolling around in pain, much to the commentators' humour. 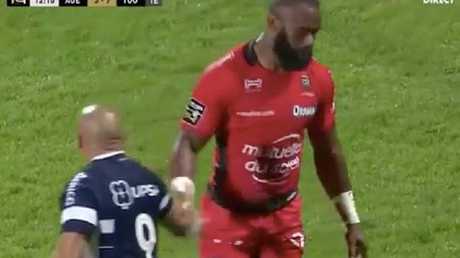 After a dressing down from the referee both players shook hands and the game resumed, with Agen eventually running out 26-14 winners despite Radradra setting up two tries for Toulon.